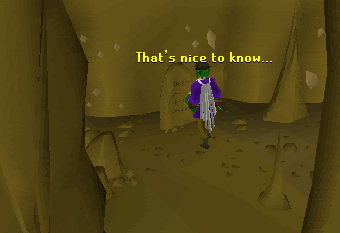 Welcome to the Underground Pass, a significant area during the Underground Pass Quest. You'll find all sorts of nasty surprises down here, from hoards of vicious Souless creatures to spike-filled pits and winding passages filled with traps! 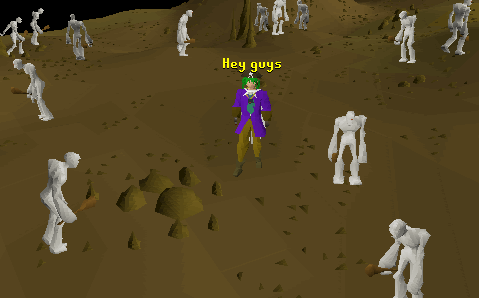 Ahoy there travelers, before you enter please make sure you have met all of the requirements for the Underground Pass quest because today we will be touring the infamous Underground Pass. Once a trade route used by merchants, the pass is now under new management. A slightly crazy man named Iban and his pets now call the Underground Pass home. Here are some basic supplies you will need on this excursion. Rope - You will need several coils of rope to successfully traverse the deep chasms. Spade - A spade is useful for opening caved in passage ways and breaking out of prisons. Plank - A sturdy plank of wood is essential if you wish to avoid some nasty floor traps. If you don't happen to have one handy, you can usually find one near the entrance of the cave. Bow and Arrows - A bow with arrows is always a good thing to have. You may need one to help lower stubborn drawbridges. It is also wise to pack plenty of good food with you if you are one of those adventurers who isn't too keen on dying. And by good food I mean stuff that fills you up. Leave the chocolate bars and vodka at home, you will need hearty meals like lobsters, stews, and cakes in this dungeon. So do you think you're ready to traverse this underground path? Before we get going it is always a good idea to bring a methods of teleportation and some money. You never know when you'll meet someone friendly enough to give you a taste of the local cuisine. You should now be prepared enough for the infamous, horrible, and deadly Underground Pass. 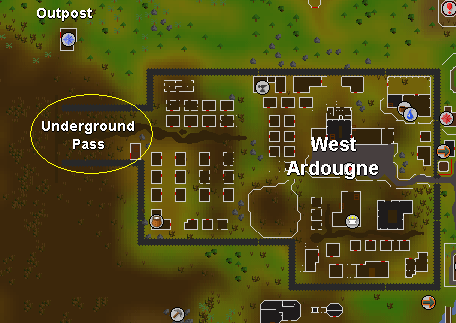 The Underground Pass is located just west of West Ardougne. Directly outside of the cave you will see a funny little man named Koftik. He is mainly just there for the quest but he can still help you get through some tricky situations. Through out the cave you will find stone tablets that say weird and depressing things that I guess Iban himself put there to scare you. Now I'm sure Iban spent a lot of time making these so please refrain from making fun of them. Thank you. As you go past the tablet you will come to an impassible swamp, luckily to either side there is a detour full of rockslides that you can climb over. Once you get around the swamp we will see our good buddy Koftik again. He isn't feeling very sociable and will just hand you some damp rags. Use them with an arrow and put the arrow in the fire and viola you have a flaming arrow. Go around to the area near the waterfall and fire your flaming arrow at the guide rope to lower the drawbridge. Grab the plank to the north if you need one and continue following the path until you get to a chasm. Here we can view the local wildlife, blessed spiders and goblins, and read another sappy tablet. Or you could just throw a rope around an overhead rock and swing across. If you fall eat some food, follow the path, and you will come out near the swamp. Repeat all the steps and try to swing across again. For those who succeed, on the other side you will see some "annoying flappy things" which normal people usually call "Giant Bats." Keep following the tunnel until you come to a room with a strange "grid" on the ground. Koftik is hanging around because he gets a kick out of watching people fall into the pits. Falling into a pit isn't a pleasant experience and you will take damage, sometimes as much as 15 hits. The trick to getting across is to walk on the "safe" grids. Sadly I can't help you here, as the path is different for each person. Pull the lever once you are safely across and the portcullis will magically open. In the next room will you see some nonliving undead Zombies (level 13 and 24), a furnace (used during the Underground Pass quest), and a one-way pipe that will help you get out if you need to. 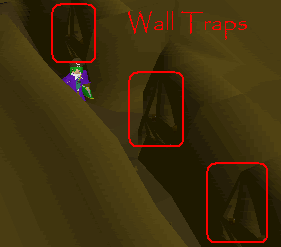 To get to the next room you will have to pass through a tight crevasse that is lined with wall traps. You can either try to disable them or run through and take damage. The traps usually do between 6 and 10 damage. In the middle of this tight passage is another tablet that tells more about Iban's incredibly interesting and very exciting life. Go past the other traps and you will enter a room with a well. If you are doing the quest get the Orbs of Light now and do what you need to do with them. The quest guide will give you more information. 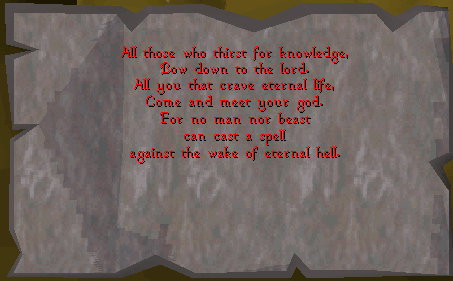 Anyways you will find an old journal near the well. It will tell you the story of some adventuring fellow and about how all his men were corrupted by Iban. 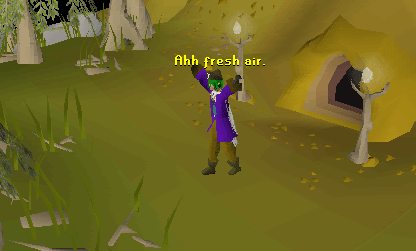 Pray at the Chaos Altar if you need to, and jump inside the well. You will end up in another part of the pass. A rope can be found nearby to replace the one you lost. Go west until you get to a jail area teeming with goblins. Pick the lock on the cage door to your immediate left and talk to the kind Slave. He will tell you about his day. Dig a hole with your spade near the pile of mud and you will enter a small passageway that is behind the cells. 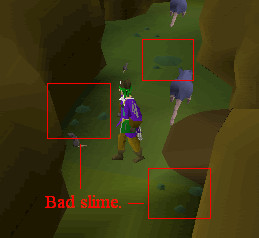 Shimmy on across the ledge, if you fail you will fall into a pit of Blessed Giant Rats near the jail. To get through the next area you can do one of two things. Pick the lock on the cage door if you have 50 thieving. Cross the dangerous bridges using your agility. Both choices have their dangers. The path between the gates is covered in swampy land. If you click on a swamp area you will be pulled under and end up back at the beginning of the pass. 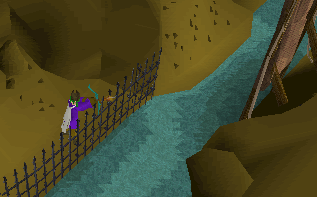 If you choose to cross the bridges you have a chance of failing the agility obstacles and falling into the spikes below which usually do 5 to 8 damage, sometimes more. Once you have passed these dangerous challenges crawl through the pipe to enter the next room. You will find a dead unicorn. He was killed during the quest when someone smashed him by using a railing on the boulder. There are also some skeletons (levels 22 and 25) just walking around. Go through the tunnel to go to the next section. Follow the path northwards, you will pass some Zombies and eventually come to Sir Carl, Harry, and Jerro. If you have killed them once already they won't like you much and will attack you. Continue west until you see a strange looking trap on the floor. Use your plank with the "flat rock" to get past. Keep going west until you get to another well, and no you don't have to jump into this one. The door won't open unless you have thrown the three crests from the Paladins into the well during the quest so do that now if you haven't already. You will now have entered a huge chamber with Iban's throne room in the center. 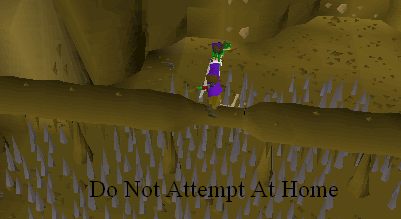 To move around you will have to leap across gaps in the bridges and this can be very annoying if your agility is low. If you fall you will end up in the large cavern below. Since you will more than likely fall into the cavern below at least once, I'll cover that area first. In the southern tip of the large cave is a dwarven settlement. Here you will find three friendly dwarves, Klank, Kamen, and Niloof. Niloof: Niloof "seems to be busy" so naturally he won't talk to you. Klank: Klank is a serious dwarf who makes "Klank's Gauntlets." These are basically just strong gloves that let you reach into the Half-Souless cages. If you happen to lose them he will sell you another pair for 5,000 coins. 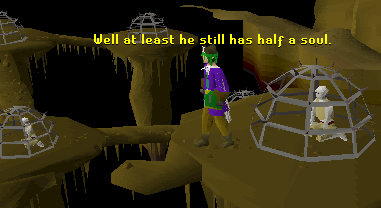 Kamen: Kamen is a slightly alcoholic dwarf. He will give you a hearty meal if you drink with him, but beware. 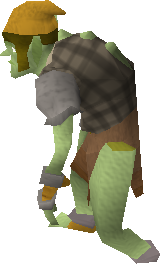 His moonshine will hurt you about 5 hp and lower your agility. Inside one of the houses you can find a bucket in case you need one. To the east of the settlement you will find the famous Tomb of Iban. 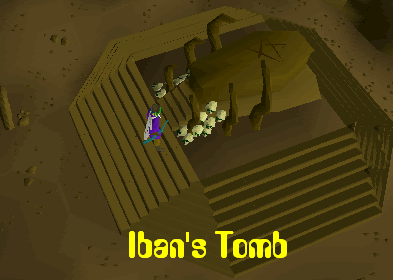 This popular attraction is slightly misleading, for Iban manages to be both alive and dead at the same time. Kinda strange if you ask me. In the middle of the room you will find hordes of Souless. Caution: Their pasty white pallor can blind the untrained eye. Nah not really. Past the Souless there will be a small passage filled with spiders. The path comes to a dead end, with the mommy spider named Kalrag waiting for you. There are no other sights to see down here, so I recommend you climb up the stair conveniently located in both the northern and southern sections of the cave. The top section is tricky to navigate because of those darn bridges I mentioned before. In the southern section you will find a witch who doesn't enjoy company and three demons. You only need to visit these people during the quest and they are not necessary to get out of the pass. In the northern half you will be able to visit the caged Half-Souless. They still have half of a soul which can be good or bad depending on how optimistic or pessimistic you are. To get out, just follow the paths as shown on the map. You will meet a couple Souless and disciples of Iban on the way. 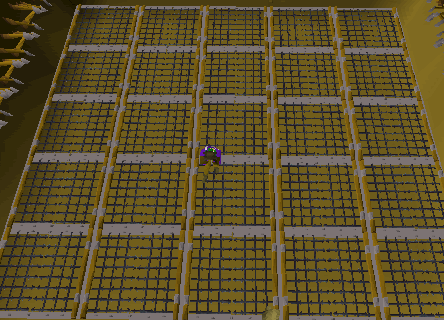 The disciples drop robes of Zamorak and broken Iban staffs if you have lost yours. They will also chat with you if you are wearing the proper Zamorakian attire. Enter Iban's chamber once you come to it and climb down the fabled Well of Voyage. There is an altar you can pray at now if you feel the urge to be holy and the long-awaited exit is just moments away. Crawl out the exit and you are now safe (well kinda) in the Elven land of Tirannwn. Well I hope you have fun in Elf land! You will also encounter many critters as you explore the cave. Here are some you might expect. Yes your run-of-the-mill goblins can be found in even regions as remote as the Underground Pass. These spiders have been blessed by Iban, making them brawnier than their cousins. 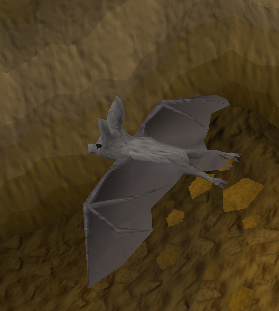 Like in most caves, you will find Giant Bats here too. There are two types of zombies in the pass; ones with axes and ones without. Neither will put up a fight though. These blessed rats are even stronger than their level 6 relatives! The skeletons walk around the poor dead unicorn for no apparent reason. The Souless used to be people but Iban corrupted them and stole their souls. Now they are deformed, snow white, and carry clubs. Half-Souless live in cages and are kinda like "Souless-in-training." They can't be fought, but they can do 10 damage to curious people who stick their hands in the cage. Gauntlets will protect you from this though. 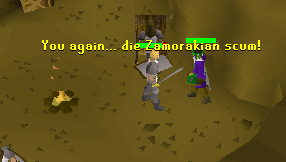 These weak disciples drop robes of Zamorak and will drop broken Iban staffs if you have lost yours. 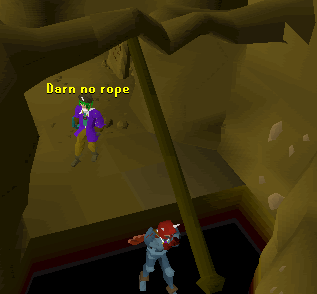 These brave paladins from Ardougne are exploring the cave too. 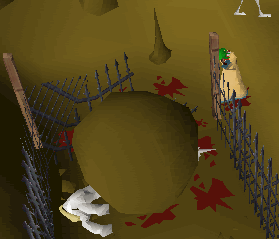 You have to kill them for their crests in the Underground Pass quest. 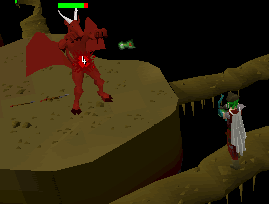 You get to fight these demons during the Underground Pass quest. They are fairly strong, but there are plenty of good spots to range them. 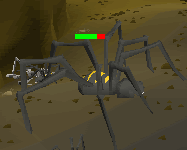 The Kalrag is a large spider that you must fight during the Underground Pass quest. It is fairly strong so you may need food.